We've been revolutionizing the shopping experience since 2008 when we first launched Ziftr.com. We've evolved quite a bit since then, but our guiding mission and philosophy have remained the same. A digital coin designed to get everyday consumers to begin using cryptocurrency. 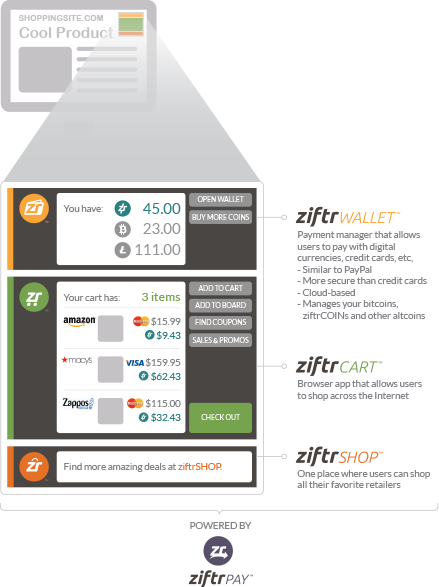 When spent within Ziftr’s retailer network, each ziftrCOIN will have a minimum redemption value of $1. Think of it as your very own Ziftr Coupon. A digital wallet that stores all of a user’s payment information – including credit cards, bitcoins, ziftrCOINs and other altcoins – in one place. ziftrWALLET Mobile is now available for beta use on Android phones, and ziftrWALLET Desktop is coming soon. A secure API that enables retailers to accept cryptocurrency and credit cards without viewing or storing the customer’s credit card information. A worldwide online marketplace where consumers can shop for hundreds of millions of products among Ziftr's tens of thousands of retailers and conduct transactions using credit cards or cryptocurrency. A one-stop shopping cart where consumers can add products from multiple retailers across the internet. We’re passionate about changing the world through our products, tools and apps, and expect everyone who’s a part of our team to share this passion. Everyone has a say in guiding the direction of the company. By keeping everyone up to date on latest developments, we can make informed decisions together. Everything at Ziftr is a team effort. Collaboration is key to our success. We believe that it’s impossible to succeed without failing once in a while. In fact, we preach that if we’re not failing 30% of the time, we’re not growing.